I am Canadian, and therefore I talk a lot about the weather. This last week, winter has really decided to flex its muscles in Toronto with whopping lows of -20 C and lots of snow to go with it. Despite the fact that I grew up in Quebec, I've never really appreciated the cold. As I was walking down the snowy street towards the subway station, pining for the warmer weather, in the meandering way my mind works, I was reminded of all the weddings I went to this summer... and I realized I had never finished blogging about all the crafting I did for said weddings! Well then. That had to be rectified. 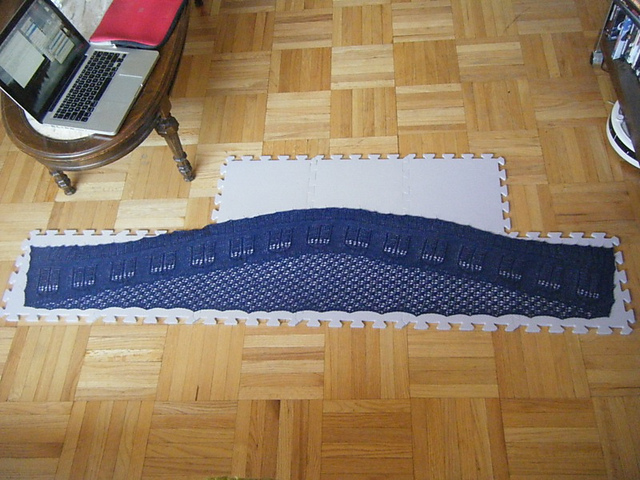 For his lovely wife, I decided to make something slightly more practical, and yet incredibly nerdy... A Tardis shawl! I know the both of them are huge Dr. Who fans (I remember him watching the entire series from the beginning back in undergrad), so I figured it would be appropriate. I used the Bigger on the Inside pattern by Kate Atherley, and I absolutely loved working it. 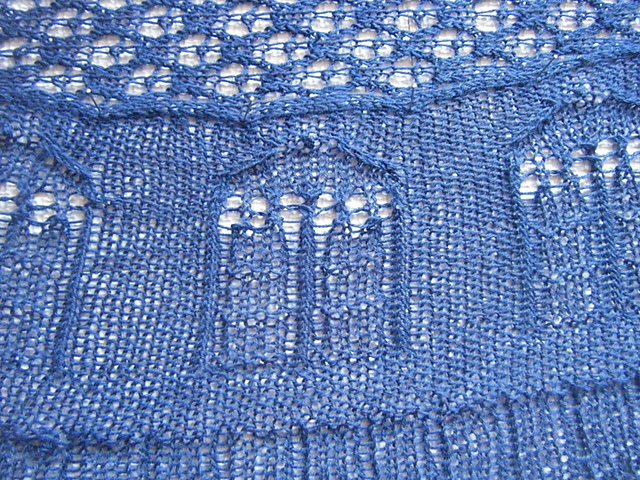 The "time vortex lace" was a little boring after a while, but the Tardis pattern, even with the super long rows, was incredibly addictive. It blocked out to about 6 feet wide, which was almost too big for my blocking mats and also 2 feet longer than it was supposed to be. Whoops! Oh well, it's a beautiful scarf anyway. The yarn I used was Cascade Heritage Solids in a perfect Tardis blue colourway (actually, the colourway is called "Marine"). This yarn is also a joy to work with! It's great for socks (I'll get to that in a later post), it's soft, it's sturdy-feeling, and it also comes in a wide range of solid colours (pretty rare for a sock yarn). I'm a huge fan, and I'd definitely use this yarn again. The final bit of wedding crafting I did let me return to my wedding-crafting roots... 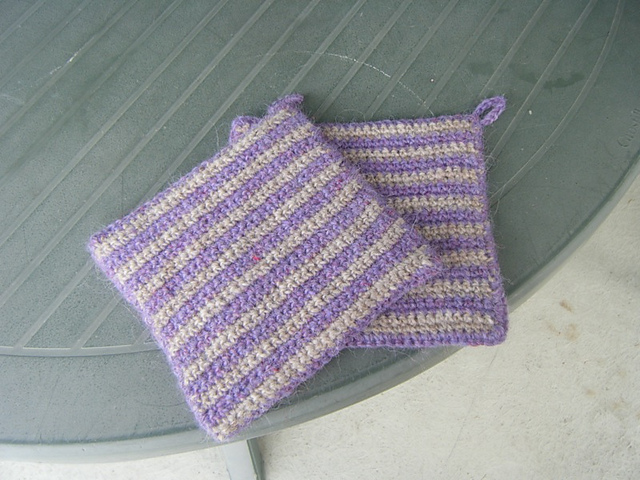 I made a pair of potholders. It was for the boyfriend's sister's wedding, and shortly after the wedding, they'd be moving to Switzerland together to start a new life there. 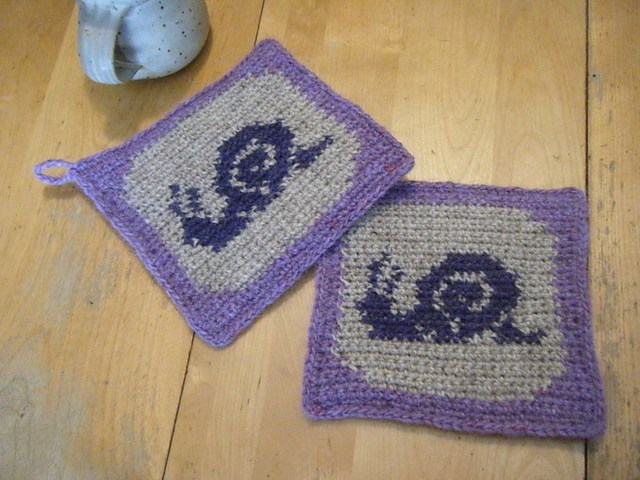 I decided to crochet these, since it was a bit of a last-minute decision to make them, and since the boyfriend and I are a little obsessed with molluscs of late (you should check out the boyfriend's band), I decided on a snail theme. I actually combined two patterns for this one. I used the Snails Chart by Stephanie Law for the main design and then this Bluebird Potholder pattern by Doni Speigle for the general design. It's double-sided, so super sturdy. The yarn is a Lopi which a friend brought me back from a trip to Iceland. 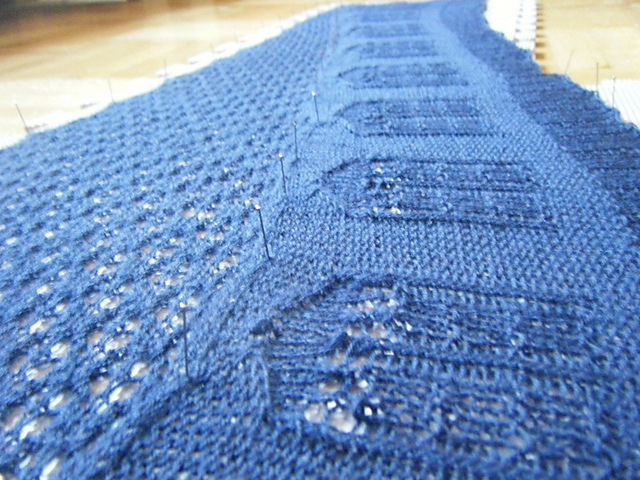 It's kind of scratchy, but works wonderfully for colourwork. I'm looking forward to making something neat with the rest of it.